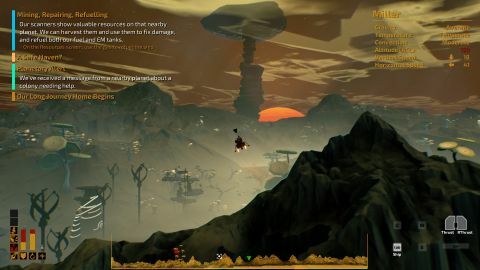 A punishing resource and repair system gets in the way of The Long Journey Home's characterful exploration. What is it: A procedural space exploration and resource gathering game where everything will go wrong. One of my favourite moments in The Long Journey Home happens before I take off. I spend 15 minutes analysing the characters, picking the ones I’d tolerate being trapped with, trying to work out if there was a secret reason I should take a potted plant into the space. It didn’t matter. Three hours later they were all dead from burns and/or suffocation. This doesn’t mean that what came after was bad (apart from the deaths), but just that the game does a smart job of defining the gravitas of your mission. You’re going into space and, despite the name, you’re probably not coming back. Your four adventurers are flung to the far side of universe and must navigate their way home by farming resources, maintaining their ship, and negotiating with a selection of distinct alien races. The journey is different each time, and their are loads of combinations of crew and craft, so there’s no ‘right’ way to play it. (Although I discovered multiple times there’s definitely a ‘wrong’ way.) The Long Journey Home largely delivers on the promise of grasping and desperate journey across space, but it’s deliberately tough. Your crew will die. Your equipment will break. Aliens will take your things. I went into the game expecting the difficulty to be high, but there are times when the balance feels off. You gather resources by dropping your lander onto planets, drilling for metals, and sucking up gases like a vacuum cleaner. You’re given a description of each planet before you land, so you don’t have to be reckless, but it’s always a risk. Any errant bumps and crashes can cause injuries to your pilot which can only be cured with expensive medpacks. Each excursion only takes a few minutes, but it’s still a gruelling, repetitive way of gathering essential resources, and it isn’t always fun. Variables such as convection, which blows your lander off course, only compound the frustration. I pimped my lander to reduce the effect of wind, but I started to dread the threat of landing on a planet’s surface. Sometimes, you have no choice but to brave the most difficult planets, and it often results in disaster. Gathering essential resources can be a chore, but it’s not the only way to play the game. The Long Journey home is full of alien encounters, which feel like the heart of the game. You could push through by just collecting resources, but interacting with the aliens and completing tasks feels like the more rewarding route. I searched for lost artifacts, located stranded explorers, and helped religious zealots wipe out alien infestation. It felt more righteous than that reads. Each encounter feels different and the aliens are all different, so you get real sense of the universe being inhabited by creatures who were there before you. Being able to actually talk to the aliens helps, too—it’s precisely the thing I felt No Man’s Sky lacked, and it brings this universe to life. It’s a bright, interesting system to explore. Characters are crisply designed, and I got a strong sense of who everyone was just by looking at them. Planets are striking and varied. The music makes everything you do feel important—even asking a crewmate what they think about a medicinal slime takes on a cosmic significance. But it’s the story that stands out, adding definition and reason to a world that would otherwise seem soulless. It’s good enough, in fact, that sometimes I wished that I could enjoy it without all the broken bones, fuel ruptures, and suffocation. The unpredictability can feel punitive. Likewise, some of the random, wear-and-tear problems your ship experiences feel mean-spirited. Mechanical failures are common, and they’re expensive to fix. There are also occasions where it feels like a solution should come quicker than it does. I foolishly accepted a gift from a suspiciously-friendly race of infectious plant monsters, because I didn’t want to seem rude—even in space, it’s important to remain civil—and I had to watch as my crew slowly became infested, aware of the issue but unable to fix it. Each playthrough is defined by the things that go wrong, which makes the game striking and memorable, but too often the resources needed to fix problems are too precious or too rare, and the game piles misery upon misery. Despite this, I like the game enough to keep coming back, and I’m ready to start my fifth (certainly doomed) attempt to get home. Each journey is a learning experience, and the vague promise of success is enough to keep me interested, even if half the missions end up with me screaming at my lander as it blows around like a duckling on a windy day. If nothing else, I won’t rest until I find out what that bloody plant does. Disclosure: PC Gamer contributor Richard Cobbett worked on The Long Journey Home.